“What is there for teenagers?” This is quite a common question from our potential guests and understandably so as there can be few things worse on holiday than bored teenagers! We know because we have two of them! At Les Crouquets we have the obvious things – roomy swimming pool, snooker table, table tennis, badminton , table football, football pitch ,basket ball net & a completely free 9 hole pitch & putt course ( par 3) – equipment included. If they can’t do without their daily dose of internet there is also free 24 hr wi-fi connection in all the cottages along with large flat screen TVs and free DVD loan. In & around the area there is also canoeing, kayaking and some ambitious adventure parks which are usually very appealing to the teenage market . 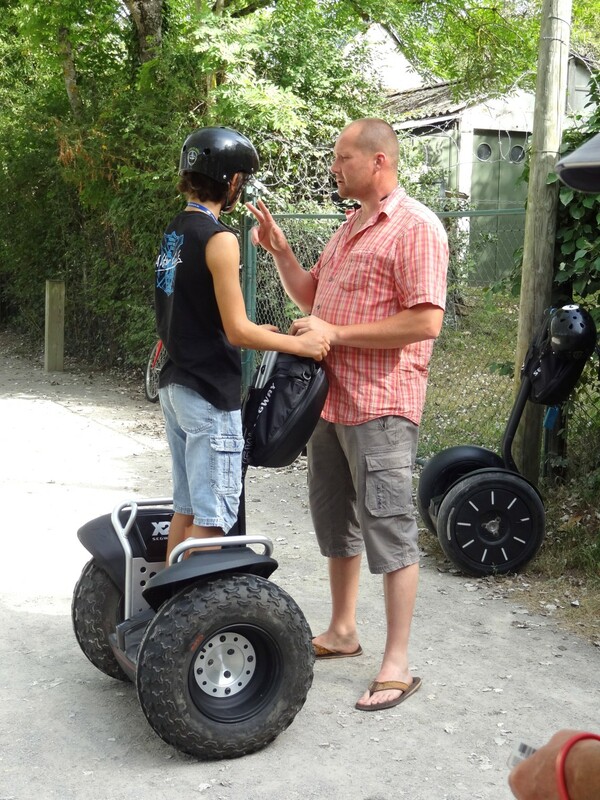 This Summer we also discovered Segway– officially described as a “self balancing human transporter” it is basically a board with two wheels and a long handle and which moves forwards, backwards & sideways , all controlled by how you balance on it , capable of travelling bewteen 13 and 20 km/ph. Great fun but definitely not a toy – you have to be 14 years old & weigh 45 kgs to be able to use them. 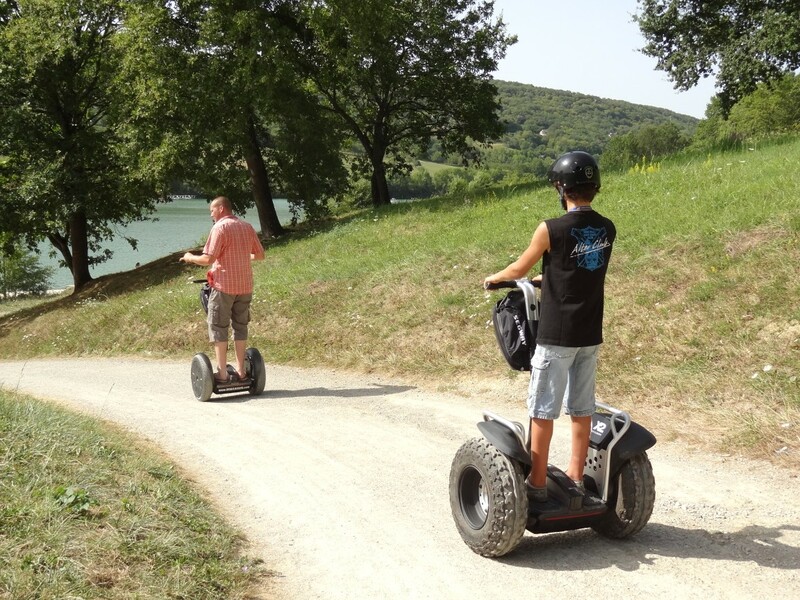 Instructor, Patrick Richard offers two circuits – one around Brive town centre & one around the Lac du Causse. 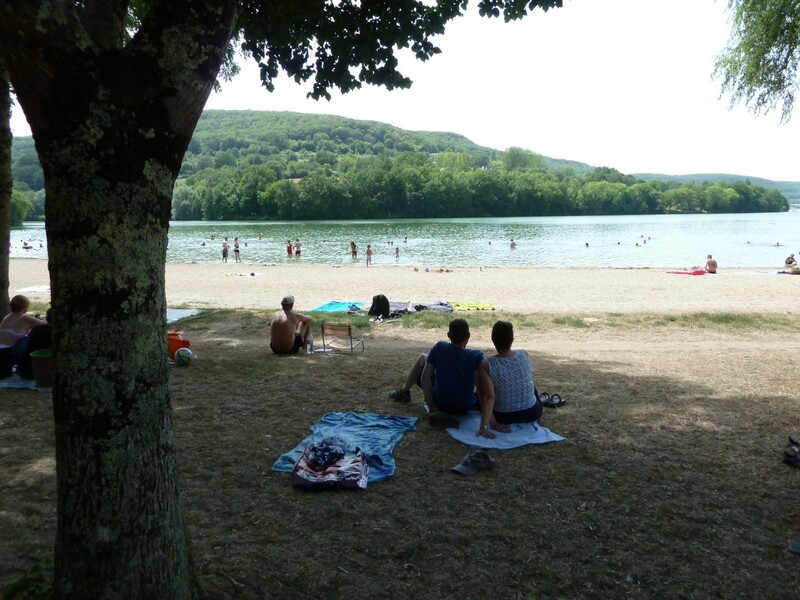 We chose the trip around the lake – it’s the scenic route passing through country lanes and along the beach where you can swim afterwards & it’s only 20 minutes from Les Crouquets. Serious training session for Alistair's debut trip! Patrick accompanies you on his own Segway or if there are 6 in the party he goes round with you on a bike.He’s very friendly and makes it all fun but very serious about following the correct procedure – Alistair had never ridden one before so got some extra tuition to make sure he could keep up with the others who were old hands on their 3rd outing! With the serious stuff out of the way it was off round the lake. Helmets are compulsory & everyone has an ear piece so Patrick can keep in touch on the trip. Heading off along the beach and right round the lake the trip is supposed to last 1 hr 15mins but by the time Patrick had stopped for group photos & video sessions and a free trial run for me & Amar ( who had gone round with them on our bikes) we were there nearly 2 hours. Good balance is essential for steep downhills! 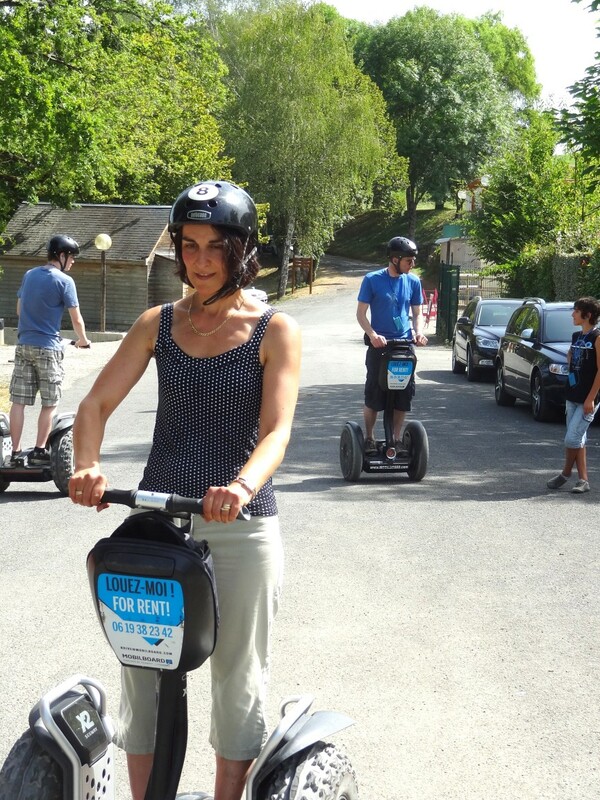 Segways are very popular with business groups, hen/stag parties ( can you imagine?!!) & are often used to distribute leaflets around towns. 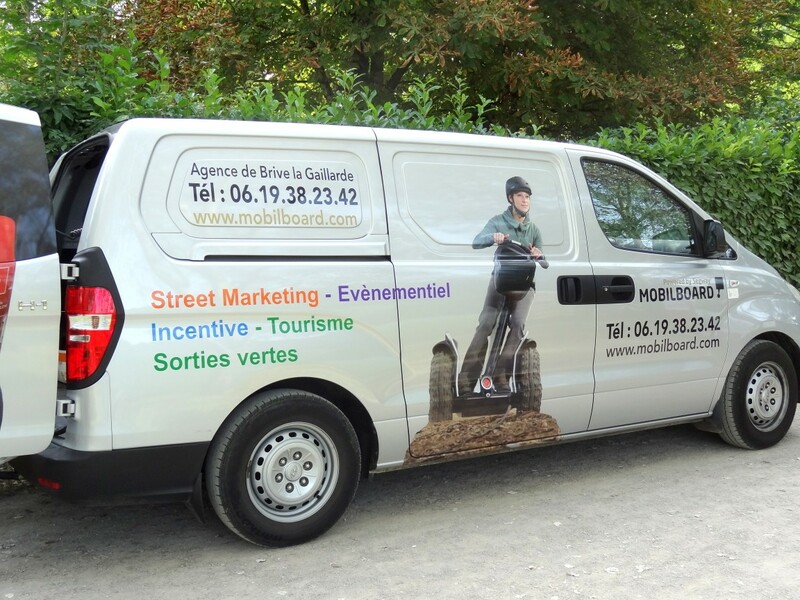 Patrick told us he once had a bride & groom turn up at the church on his Segways – an amusing alternative to the traditional horse & carriage or limousine!! Pause for a great photoshoot! I couldn’t help conjuring up the vision ( not a pretty one I have to say!) of me arriving at my wedding on one of these…!! On my mini trial run mine had a life of its own and as all the others were whizzing round the square having a great time I was trying to stay upright with white knuckles and tension etched all over my face…I’m sure I would have got there in the end though – Patrick said so. Not as easy as it looks for us oldies!! 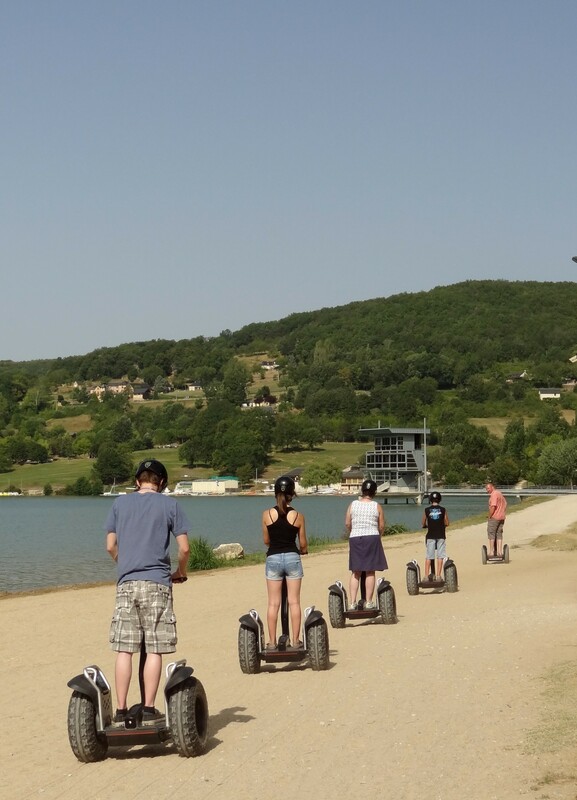 After a more intense training session you can hire the Segways and go out on your own and Patrick will also deliver them to you if you have other tracks you would like to ride them on but to be honest the Lac du Causse is such a perfect setting that it would be hard to beat. Brilliant! It was a great day Elena. 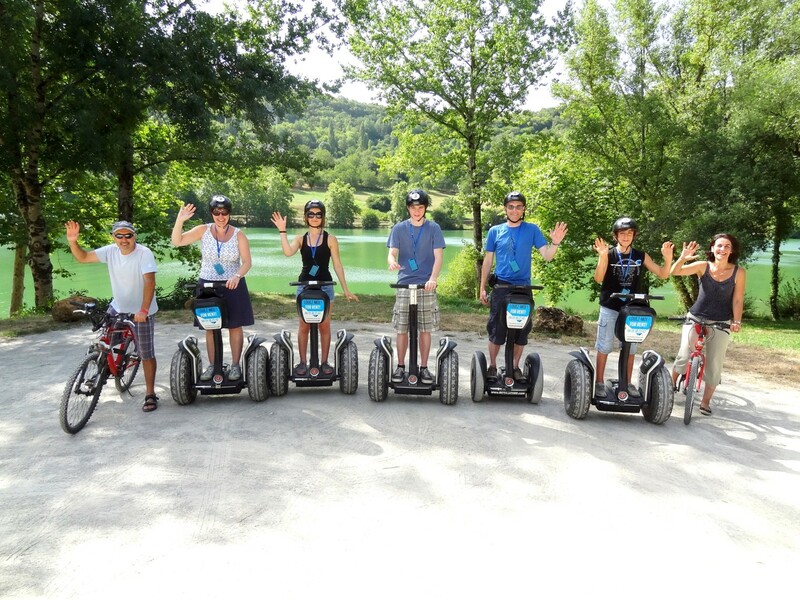 I notice you didn’t include the group photo with everyone facing forwards except Amar whose Segway was heading off on it’s own! Also for the teenagers, La foret des Ecureuils, was good again. This year they had a new zip wire which is 400 metres long. Ed thought it was superb. Thanks Tim! 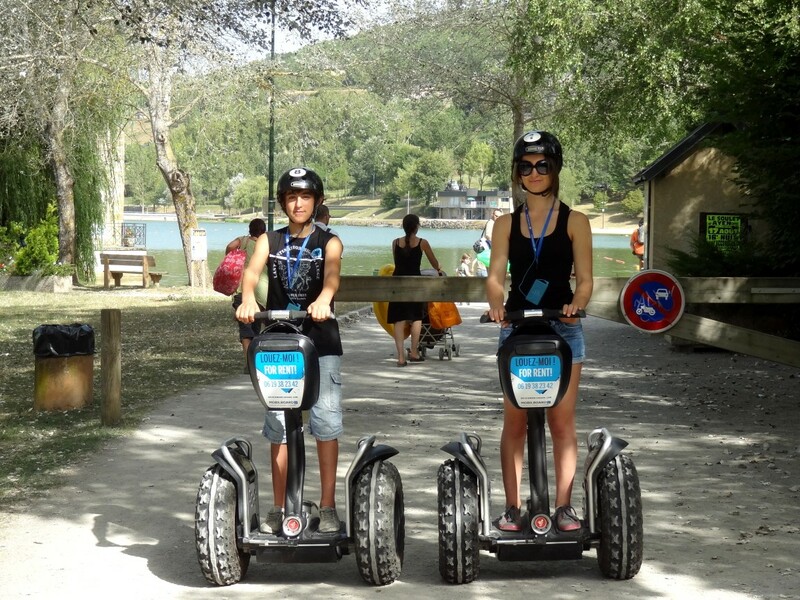 I must look out the wayward Segway photo – must have missed that one!! I’ll try to write something about La Forêt des Ecureuils ( Squirrel Forest!) in the Places to Visit section fairly soon! Just a couple of weeks to go & I should have a lot more time!! wow! that looks like a lot of fun!! !